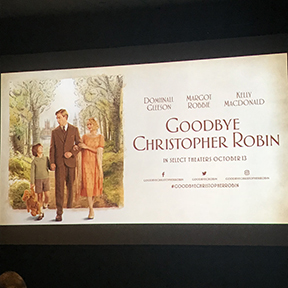 My husband and I managed to get free advanced movie screening passes from https://foxsearchlightscreenings.com to see Goodbye Christopher Robin last night at Landmark Theatres Keystone Art Cinema. I believe that this movie has been showing in select US theaters since Oct. 13th, but it will start showing in Indianapolis tomorrow night (10/26) at Keystone Art Cinema. If you are big fan of Winnie-the-Pooh, you must see this movie. You will appreciate Winnie-the-Pooh even more if you know the story behind it. It was a very touching story of how Winnie-the-Pooh was created based on a true story. It will make you cry. I did. My girls also went with us and they said they enjoyed the movie. It is rated PG so parents, you will need to watch the trailer / read the descriptions to decide whether or not it’s appropriate for your child(ren). For more info about this movie opening in Indianapolis, check out its trailer and ticket information by clicking here. Next Post My little girl’s $5 challenge!